Business analytics and intelligence tools provide organizations with the means to optimize business operations, and gain a deeper understanding of the issues that occur, why they occur, and how best to fix them. At Back Office Pro, we are experts in providing business analytics solution for businesses from essentially every industry. We have deep expertise in statistical analysis, which we leverage to provide our clients with powerful insights into their operational and customer data. 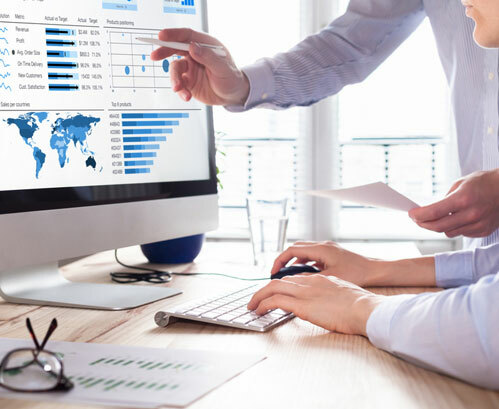 We rely on the latest analytics technology and statistical techniques to provide companies with comprehensive reports, intelligence, and deep analysis. Financial Analytics We model your data for valuable financial insights that can help you maximize your company’s profit and revenue. Telecommunications Analytics We provide detailed analysis that can help you increase sales, reduce churn and fraud, improve risk management, and decrease operational costs. Retail Analytics We can arm your retail business with information in order to identify, maintain, and attract the most profitable customers. Market Data Analytics We analyze the performance of your marketing strategies to help you understand how effective they are and where improvements can be made. Consumer Product Analytics We can help CPG companies understand the impact of sales, supply chain, financial, and customer-focused decisions on their bottom line. Predictive Analytics Study the historical pattern and identify risks and opportunities to improve your organization’s performance at present as well as in the future. If you are looking for a partner to help guide you along the path of becoming highly successful by outsourcing analytics and business intelligence services, contact us today to learn more, or browse our website to learn about all of the services we offer to companies just like yours.